alaTest ha recogido y analizado 16 comentarios relacionados al producto Vortex Solo 8x36. En promedio, la calificación para este producto es 4.7/5, al ser comparado con la calificación 4.3/5 de otros productos en la categoria Binoculares. La gente está impresionada con el diseño y el tamaño. La fiabilidad y la funcionalidad también se valora. Analizamos las valoraciones de los usuarios y los expertos, la edad del producto y demás factores. Comparado con otros Binoculares el Vortex Solo 8x36 recibe una alaScore™ global de 89/100 = calidad muy buena. I bought the Solo 8x36 to carry while out trail walking with the dog and was rewarded with great sightings on the first day out. Excellent performance as advertised; love the light weight and the fact that it only requires one hand. No complaints. Delivers bright clear views with excellent depth of field, making it easy to find objects. Solid construction and they used great glass to make these. You will not regret buying it! 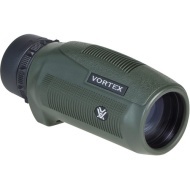 Crystal clear optics, I am amazed at how good the optics are on the Vortex! The size and feel is great for an 8x36 and the belt clip is made very well. Worth every penny and to be honest the build quality is so good, I think it was a great deal! This optic has great field of view and crips clear colors across the entire lens. Clear optics, easy to use the focus ring. By far superior to another 7x32 that I have and a world apart better than a standard 10x25. The view is wide and clear, VERY sharp.